Community College Success: Should you get a two-year or four-year degree? I recently had a student in his first year of community college ask me if he should get a two-year or four-year degree. 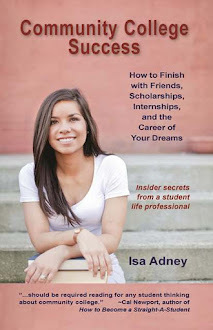 My book talks all about how community college is a great place to get your two-year associates degree and then transfer to a university to get your bachelor's degree. I think it's great to get your bachelor's degree, especially if you aren't one-hundered-percent sure what you want to do. Bachelor's degrees open a lot of doors. I wasn't exactly sure what I wanted to do when I started college, so I am so thankful for my bachelor's degree; I even went on to get my master's degree - something I never thought possible. I love school, and I think you should take your education as far as you want. But that is the key - how far will it take to get you to where you want to go? For some people that may mean a PhD. But for others - it might mean a two-year degree. There is not only one right path. Community colleges offer incredible career-focused two-year programs. Below is a short vlog I did explaining some things for you to think about if you are considering what degree is right for you. The #1 thing you should do is talk to a college advisor and a career counselor in your career center. The key is research, and I hope this can get you started in figuring out what is best for you and your goals.